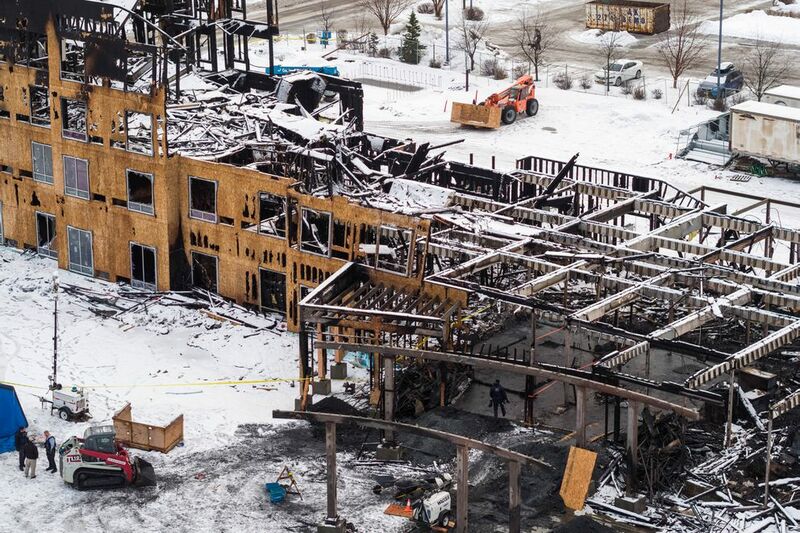 The developer of a partly constructed hotel that burned down over the weekend in Midtown Anchorage intends to “pick up the pieces and rebuild,” a representative of the company said Thursday. 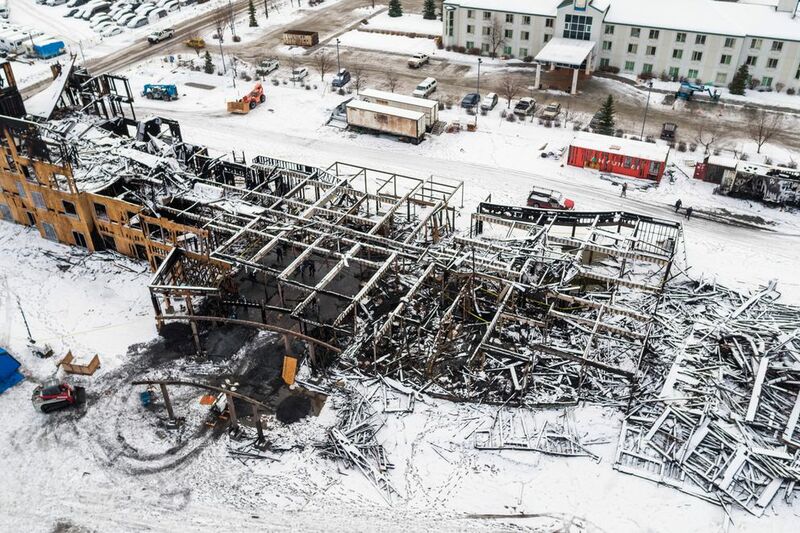 Construction on the Courtyard by Marriott in Midtown Anchorage was scheduled to wrap up in late September, but a fire that destroyed the building early Saturday morning has postponed that date indefinitely. Ric Marko, principal at Affinity Hospitality, which owns the property, called the fire a “complete devastation,” but said his team is already making plans to move forward with the project. The building’s structural frame had been completed when the fire broke out, he said — the roofing process was nearing its end, the interior corridors had been drywalled and the electrical boxes and wiring were about 90 percent installed. The site also had two temporary gas heaters, but because they were located outside the unfinished building — warm air was forced inside via ducts — Marko said he thinks it’s unlikely that they are the cause of the fire. The fire, which might be one of the most expensive Anchorage has ever seen, caused millions of dollars in damage. 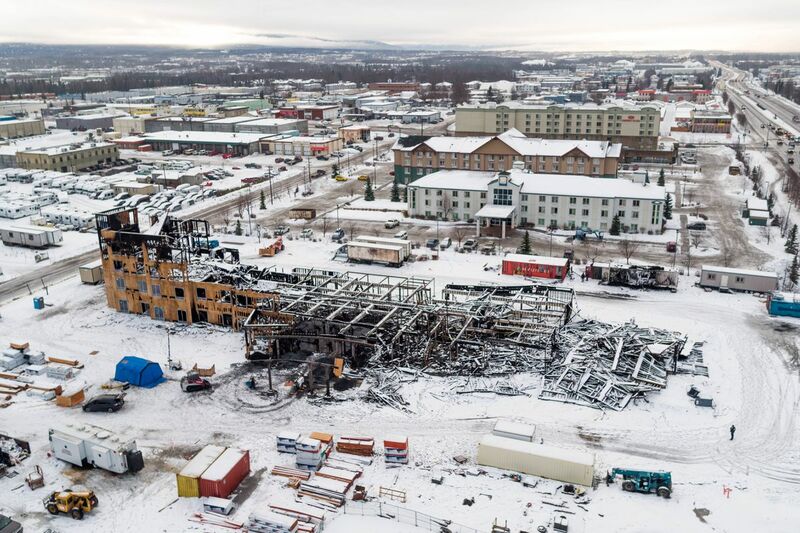 Anchorage Fire Marshal Cleo, quoting the project’s construction superintendent, estimated the damage at about $20 million, although Marko called that a “guesstimate,” saying the real extent of the damage is still unknown. The building was insured for about $24 million, he said. Marko estimates it could take as little as five and as many as 10 months to rebuild the hotel to the same stage it was at before the fire, depending on whether the building’s concrete slab and foundation have been damaged. He expects construction to begin again in the next 30 to 60 days. In the meantime, many of the laborers who had been working on the site are now out of a job. Most of the workers were unionized and can be reassigned, but some will have to be let go, Marko said. Between 40 and 50 construction workers worked at the site daily. “That is the part that I personally struggle with the most,” he said. The cause of the fire is still under investigation. Fire investigators were able to enter the building early this week, but officials are not saying anything publicly about what that found inside. The Anchorage Fire Department has asked members of the public to come forward with any information or surveillance video, including smartphone video. The construction site was equipped with surveillance cameras and fencing, and the developers had been in talks with a local security contractor to begin having guards monitor the site during nights and weekends, Marko said. The building burned down before that could happen, but additional cameras will be added to the site will the rebuilding effort is underway, he said. While Marko said he has no reason to believe the fire was set intentionally, he also said he knows of situations where disgruntled subcontractors, often upset by a missed payment, have set fire to unfinished buildings. However, he would be “shocked” if anyone involved with the project was responsible, as the company hasn’t missed any of its payments, he said. “I can think of absolutely no reason — and no indication of any reason — why any of them would want to do such a thing,” he said. Affinity Hospitality also developed the Home2 Suites directly next to the Courtyard by Marriott. The company has never had an incident like this happen before, Marko said.